ACES possess several unique advances over other resistive exercise mechanisms. ACES employs a sturdy digital hydraulic resistor pack—instead of weights, springs or manually-adjusted pneumatics—to ensure safety, quietness and efficiency. ACES combines a unique set of objectives which will be quite beneficial to you and your organization. Naturally we have the objective to help you to achieve maximum health and fitness in the shortest possible time, but we go one step further. For the first time, you can now use advanced technology to manage and control your exercise system. The unique ability of ACES to direct the hydraulically controlled resistance component in a “closed loop” environment sets ACES apart from any other exercise equipment that currently exists in the fitness market today. Not only can the ACES create an isokinetic experience for all muscle groups, but the software component is able to record and quantify the results for all individuals and their trainers/therapists to understand the strengths and weaknesses of an individual or a patient during and after each workout. Isotonic: a contraction where the muscle changes length when moving against a constant load like in a dumbbell curl. Isometric: a contraction when joint angle and muscle length do not change like when pushing against a wall. Isokinetic: a mechanical device that gives back resistance equal only to the amount of force applied and takes place at a constant speed. The ACES is the only machine which can use all three forms of exercise to work muscles. In the initial stages of an isotonic lift (i.e. biceps curl), the joint is working against the weight of the dumbbell plus gravity and inertia; therefore making the beginning portion of the lift more difficult. Once the gravity portion of the lift is overcome, contractions and muscular recruitment are lessened through the remaining range of motion. As a result, muscular contraction varies and is never consistent during this form of exercise. Conversely, ACES’ computer controlled technology ignores the forces of gravity and provides constant and equal resistance throughout the entire range of motion allowing the full spectrum of muscle fibers to engage evenly throughout the entire range of motion. With isokinetic technology, the harder one pushes, the harder the computer communicates to the machine to push back. Closed-chain exercise protocols are used extensively in rehabilitation of knee injuries and are increasingly used in rehabilitation of shoulder injuries. They are felt to be preferable to other exercise programs as they are considered more functional because they closely simulate the actual movement patterns encountered in both sport and daily activities, create little shear stress across injured or healing joints, and reproduce proprioceptive stimuli. Because of these advantages, they may be used early in rehabilitation and have been integral parts of "accelerated" rehabilitation programs. Closed kinetic chain exercises are safer, particularly with regard to a healing ACL graft. ACL strain is reduced during closed kinetic chain exercise by virtue of the axial orientation of the applied load and muscular co-contraction of the quadriceps and hamstrings. In addition, closed kinetic chain exercise, through recruitment of all hip, knee and ankle extensors in synchrony, takes advantage of specificity of training principles. Most functional movements in the lower extremity take place when the foot is on the ground. Muscle contractions in closed kinetic chain motion are different from those in open kinetic chain motion at the same joint, and they also recruit all 3 joints in unison. Closed kinetic chain exercise is more effective than joint isolation exercise in restoring function in patients with patellofemoral dysfunction, improving reflex stabilization and proprioception, reducing pain and promoting a return to normal daily activities and sports. For athletes in particular, closed kinetic chain exercise has been shown to more greatly improve strength and jumping ability in comparison to open kinetic chain exercise. 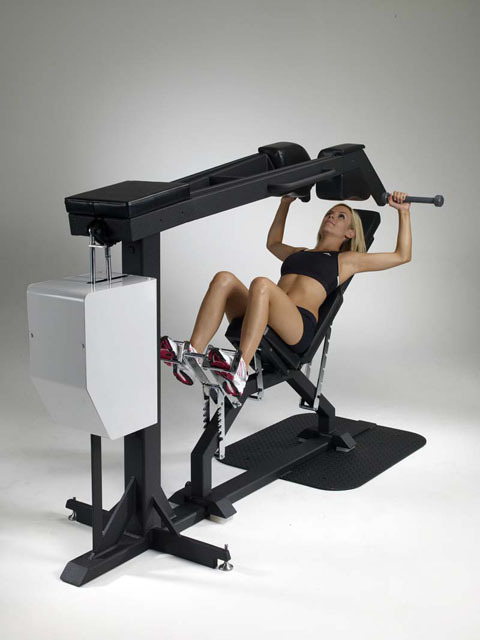 ACES is the only “Closed Chain” isokinetic exercise machine on the market in a multi-function and multi-joint platform. Generated on 4/25/2019 1:27:17 AM (PST) ADI/HQ/GBA/2019/ARIELCLOUD/v3.0.2018.0126.